What style is to our thoughts, dressis to our persons. It may supply the place of more solid qualities [sic], and without it the most solid are of little avail. Numbers have owed their ele- vation to their attention to the toilet. Place, fortune, marriage have all been lost by neglecting it . . . The plainest dress is always the most genteel, and a lady that dresses plainly will never be dressed unfashionably. To modern eyes even the simplest of the costumes shown in the catalogs of the day are far from plain. The lavish trimmings and elaborate draperies reflect an era in which women and children were considered as passive and ornamental. They are a perfect complement to the overstuffed parlors, the plethora of ornament, and rococo richness that characterized nineteenth- century taste. The late 1880s was an interesting period in the evolution of boys' clothing. Much continued on from earlier periods. Boys still wore dresses until they were about 4 or 5 years old. At that point many fashion styles were available to the discerning tastes of fashion conscious mother. If the mother did not think her curly haired son was ready for trousers, she could purchase suits with kilt skirts rather than pants. These were available in many styles, Scottish, sailor and after the mid1880s more elaborate jackets and blouses. 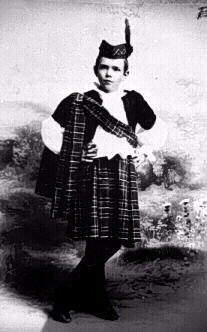 These kilt suits were generally available in sizes up to 8 years which meant that boys as old a 9 or 10 might wear them. Another option mothers had were tunic suits ot Buster Brown suits. The little tunic jacket made it look almost like a smock and in some cases covered th boys' short, above the knee bloomer pants. The Buster Brown suits has broad white collars and floppy bows. The tunic hackets had high collars, but generally not stiff collars and bows. The suits were almost always worn with long stockings and bare legs were not common. Other mothers might decide that the time had come to cut their little boy's curls and purchase pants. The pants would be knee length and worn with long over the knee stockings, help up by a suspender waist. These short pants suits came in many of the same styles as the kilt suits. A new style appeared in the late 1880s after the publication of Francis Hobson Bennet's Little Lord Fauntleroy. Soon boys up to 10 and 11, in some cases even older, were wearing long sausage curls, and fancy velvet suits with delicate lace collars. Mothers loved these outfits. The boys, especially the older ones while they were glad to be out of kilts, hated them. When going out side the boys in Fauntleroy and other fancy suits, including sailor suits and Buster Brown suits, would wear broad s-brimmed sailor hats with long steamers and held on by an elastic chin strap. These hats would not be worn just to church or parties, but rather even for informal outings to the park or even the beach. Some boys had special hats for dress up, usually ones with especially large brims. We are, of course, talking about children from well to do, or at least confortably well off families. The more elaborate fahions discussed here have nothing to do with the common folk that laboured in factories. Fashion was a private performance of the well-to-do until well into the 20th Century. The children discussed here are the sons of the bourgeoisie, the new middle class that was neither noble nor poor but who were to dominate the European countries and who became the trend-setters of that era. Their wealth came, for the most part, from the new industries they financed and the factories they ran and owned, or from high education jobs that let them take part in the new industrial boom. In that they were different from the nobility, whose wealth was inherited, at leasdt in the 19th Century. So the bourgeoisie on one hand imitated the nobility by showing off, and stressed their being different in that they had - more or less - earned their wealth. In this context, fashion played a role in the establishment of the identity of this new class which, by way of being new, had no tradition and no fixed identity. The lack of identity is probably why the bougeoisie envied (thus, imitated) the nobility while at the same time looking down their noses at them. The need to show their new status filtered down to how they dressed their children. For some the elaborate fashions such as the lace trimmed Fauntkleroy suits were an attmpt to flaunt their weaklth and an attemp to emulate the pomp and extravegance of the nobility.